Steel company ASD Batchelor has announced it is leaving Haverhill, giving its 30 staff the choice of losing their jobs or moving to the West Midlands. The company is transferring its steel processing operation from Falconer Road to an existing sister plant at Tividale, which is more than three times the size, from September 30. Peter Park, regional director for ASD Batchelor, said the company would be sad to leave Haverhill, where it had been based for more than 20 years. However, it made commercial sense for all processing to take place close to the source of the raw steel in the West Midlands. All staff had been offered the opportunity to re-locate with the business and would be given an allowance to help them do so if they decided to move. A visit to the Tividale plant would be arranged for those considering a move. “We have thought long and hard about this. All the raw material we use at Haverhill comes from our sister depot at Tividale and it makes sense to centralise the processing at one unit. It will enable us to provide a better service for our customers. “We will look at employing the same numbers of people at Tividale and we hope that many of the staff we currently employ at Haverhill will make the move. “We have got to look to the future and we need to move to a more appropnate part of the country for our business. The West Midlands offers us the opportunity to distribute nationwide,” Mr Park said. 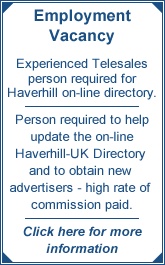 Batchelors at Haverhill was taken over in 1990 by the ASD Group, which has a total of around 600 staff at 25 businesses around the country.